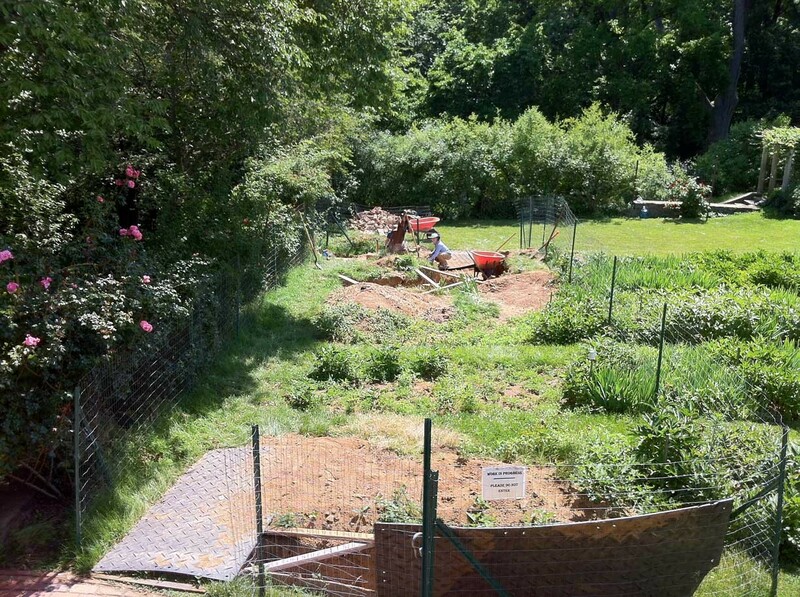 The garden staff at Dumbarton Oaks began the excavation of the pit house early in the summer of 2012. They used a 1932 survey of the property to determine the structure's approximate boundaries. 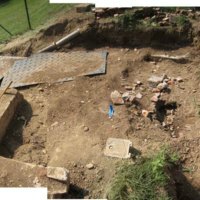 Their first discovery was the largely intact brick stairway descending to the front entrance of the house on the northeast side of the frame yard. Subsequently, a cut was made at the west end of the house; the brick walls in this location were no longer intact, but the concrete foundation and some brickwork mark the location of the foundation and the thickness of the walls. The excavation has not been an archaeological dig in any way, but throughout the process we have been careful to preserve as much of the original structure as possible and we have collected a great number of artifacts that provide clues about the kinds of materials used in the pit house's construction. 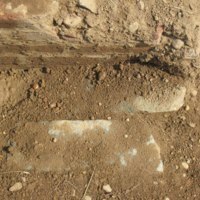 The work of excavation has been slowed by the way in which the pit house was deconstructed and buried: exterior and interior walls were collapsed inward, and the resulting brick rubble was layered with alternately clay-rich and sandy soil. This combination of rubble and compacted soil is a difficult medium to penetrate with shovels and trowels. To date, the stairs, stove enclosure, tank enclosure, granite retaining wall, concrete center aisle, and both west and south foundations have been uncovered. The concrete foundation of the structure, the entrance steps, and the concrete and brick wall on the south side are largely intact. The stove is in its original location, though it several pieces of it were dislodged during the collapsing of the pithouse when it was supressed. The brickwork enclosing the stove and tank enclosures, however, while intact, are crumbling. The granite retaining wall extending from the entrance on the west side to the south end of the frameyard is completely intact in spite of being unmortared. 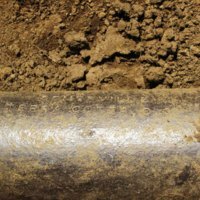 One large piece of terra cotta water main remains, but is obviously not in its original position, and so we cannot determine the way in which hot water was conducted through the structure. We have not yet been able to find evidence of the bench support structure, and so cannot determine whether the foundations were made of brick or iron pipes. The quantity of tile and slate fragments indicate, however, that these materials were used on the bench surfaces. While the house was likely used for vegetables at one time, with the discontinuation of the vegetable garden it was almost certainly used only for forcing flowers. Several rose plant tags were located, and can be viewed among other artifacts in subsequent pages within this exhibit. While it is likely that most of these artifacts are derived from the pit house, it is also possible that they accompanied the fill used to supress the structure. We have not yet determined the source of this fill, thought it is possible that it was simply taken from the closest locations immediately north and east of the structure. 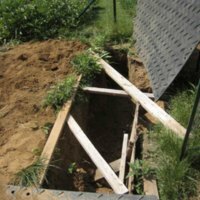 The soil in this area was very sandy, necessitating the installation of boards and other wooden support structure to prevent the soil from collapsing on top of the revealed foundation. 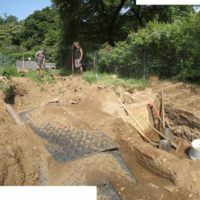 This view west from the east side of the excavation site shows the brickwork container that we suspect contained a cistern, and the stairs on the right leading to the entrance. This is a good example of the mix of brick rubble and compacted soil. The 5" terra cotta water main is visible at the top left section of this panorama. The concrete foundation of the south wall of teh pithouse is visible at the top right. 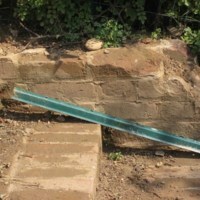 The brick walls on either side of the stairs leading to the pit house entrance were collapsed. Here you can see the broken bricks that remain at the base of the wall. A detail view of the terra cotta pipe, which reads "SOMERVILLE TERRA COTTA, D. O."